DoorTech Industries Greater Vancouver Service Area. DoorTech Industries Ltd. Provides commercial door and loading dock services and repairs throughout the Lower Mainland including the Fraser Valley and Greater Vancouver. Why choose DoorTech Industries Ltd.? When you choose DoorTech Industries Ltd. To repair or service your commercial doors or loading dock you are partnering with a local, family-owned company. The DoorTech team are experts in commercial overhead door and loading dock systems and they can repair or service ALL makes and models of doors. 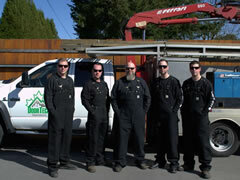 With an average response time of 30 minutes anywhere in Greater Vancouver we can be on-site quickly. If you'd like to schedule service or an estimate please call (604) 315-3667 or fill out our contact form and we'll get right back to you.